​Guitarist and composer Stuart Weber is a native of the Northern Rocky Mountains and is deeply influenced by the spirit of the West. He credits the long, harsh winters in Montana for giving him time and space to develop as an artist. 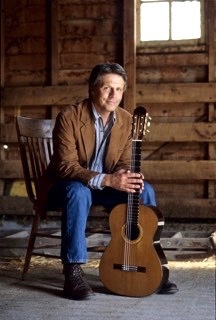 ​Self taught on the guitar, and tutored by the sounds of the 1960’s, his formal guitar training came in 1981 when he auditioned and was accepted to study with legendary American guitarist Christopher Parkening. ​During the decades that followed, Weber produced six acclaimed recordings, dozens of original compositions and logged hundreds of miles between concerts. His works have found their way into environmental documentaries, feature films and television. In 2005, in a daring collaboration with author Alan Kesselhiem, Weber participated in his first full length PBS documentary Confluance, a Duet of Words and Music. In 2010 he teamed up with violinist Angella Ahn to perform on the Emmy award winning PBS program 11th & Grant with Eric Funk. Stuart Weber and his wife live on their farm at the bottom of the Bridger Mountains near Bozeman, Montana.